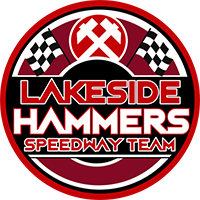 Richard Lawson was crowned 2018 Hammer of the Year, as the weather gods rained on Lakeside’s parade as they made their bid for Championship Grand Final glory. The Hammers were just easing into a potentially dominant position when the elements conspired against them. Ten points clear with four races to go and their heat leaders in superb form – Richard Lawson, Adam Ellis and the peerless Nick Morris had dropped just a point between them at this point – they looked set to take a big lead to Derwent Park for tomorrow’s second leg. But then the rain came – and stayed for 45 minutes. Eventually, after plenty of track work and a lot of consultation, riding – rather than racing – was resumed. But the result was two processional 5-1s, one for each side, with riders struggling to turn in the corners. Further discussions took place, but with a majority of riders on both sides feeling conditions unsafe, referee Margaret Vardy made the inevitable decision. 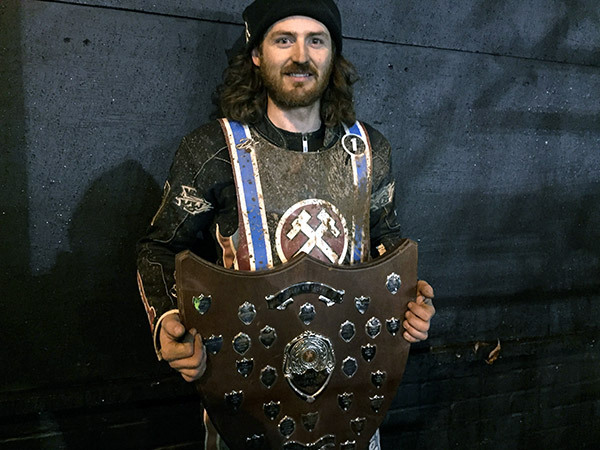 Home skipper Richard Lawson – named as the supporters’ rider of the year from an online poll immediately afterwards – accepted the verdict. “Obviously towards the end there conditions got tricky,” he said. “A 10-point lead is nice. I feel before the rain we were looking to get some big results in heats 13 and 15. “But we can go confidently up to Workington with 10 points. Action before the rain was entertaining, with Morris superb in heat four to pass Nicolai Klindt and Mason Campton before the second bend of the second lap. And Ben Morley nearly caused a sensation in heat 11, holding back Rene Bach for virtually three laps before the visitors’ number one slipped through. But now it’s all about tomorrow. As the weather cut short the end of meeting presentations, The Hammers Committee are also planning to hold an end of season get together in Essex, for fans in November. Further details will be announced shortly. Nick Morris 12, Richard Lawson 10+1, Adam Ellis 9, Ben Morley 5, Zach Wajtknecht 4+1, Alfie Bowtell 2+1, Kyle Newman 2. Mason Campton 9, Nicolai Klindt 8+2, Rasmus Jensen 6+1, Rene Bach 6, Tero Aarnio 5+2, Kyle Bickley 0, Dan Bewley R/R.